Play It Forward - "Ode to Neil"
By JAY WHITE. Donations go to Parkinson's/Cancer Foundations. Minimum donation is $2. Any amount above $2 is tax-deductible. 100% of project revenue goes to Parkinson's/Cancer Foundations. JAY WHITE will be notified of your name and donation amount. This new cover of the classic Dan Fogelberg song "Leader of the Band" has been retitled "Ode to Neil" (Leader of the Band) and features new lyrics by Steve Tatone that tells the "Story of My Life" and conveys my deep feelings as it relates to my 3-decade long career performing the songs of an American Music Icon on stages around the world with his blessing. 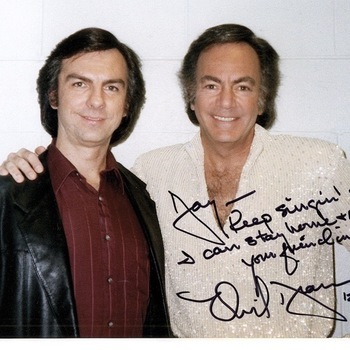 This heartfelt homage to Neil Diamond says everything about how I and millions of Diamondheads who follow this 'Solitary Man' really feel...and hopefully conveys how much we miss him and the "best band in the land" as he battles Parkinson's Disease. Producer Steve Tatone brought in Guitarist Chris Walker & Violinist Marcus Ratzenboeck to create the beautiful music tracks...and this song was mixed and mastered at Marcus's H&M Studios in Sarasota, Florida. 100% of the proceeds from Downloads of this song benefits the Davis Phinney Parkinson Foundation & the Jennifer Diamond Cancer Foundation. Please turn on your Heartlight and donate generously! And ask everyone you know to do the same if you love Neil as much as I do! Thank You.